Damaged water pipes that may have gone unnoticed during the deep freeze are beginning to reveal their flaws. As temperatures in Minnesota climb above zero for the first time in days, frozen pipes are melting and causing problems in homes and businesses. The Minneapolis Fire Department had received nearly four dozen calls from residents with broken pipes as of Friday afternoon, said assistant chief Bryan Tyner. Firefighters won't fix them, but Tyner said they can stop the situation from getting worse. "What we can do is we show up, we shut off the water, and we help to mitigate the spill," he said. "We can pump water out using submersible pumps and hoses, and we also carry a squeegee so we can move it down the drain." The calls didn't start coming until once the worst of the cold weather passed, Tyner said. That's because some pipes that had been damaged began leaking only after the ice around them began to melt. But it has been an extremely busy week for plumbers. At Hero Plumbing, Heating & Cooling, manager Chris Stevens said on Wednesday alone the company received around 1,400 calls — nearly three times the volume for a typical January day. "We've taken half our plumbing team and dedicated them strictly to running frozen pipe calls," Stevens said. "That's something that we don't typically do, but this past week it's what needed to be done." Besides frozen pipes, Stevens said crews had to fix a lot of broken boilers and furnaces. When temperatures reach minus 28, he said, every call is an emergency call. During the polar vortex of 2014, many Twin Cities residents lost water service entirely after the lines from the street to their homes froze. In St. Paul that year, crews went out with a generator and connected heavy cables to the pipes to thaw the lines with electric current. But Brad Eilts with St. Paul Regional Water Services said his office got just four calls for service this year. Eilts said that's likely because the first part of January was warm and the ground didn't get cold enough to freeze residents' service lines. "The frost was only a couple of feet deep, where back in 2014 I think the frost was getting down six or seven feet and getting down where some of our service [lines] were freezing at that depth," he said. Water systems in southwestern Minnesota were similarly lucky. At one point five years ago, crews with Lincoln Pipestone Rural Water, based in Lake Benton, had to dig up and thaw a quarter-mile section of pipe. General manager Jason Overby said that was not a problem this year in part because snow pack kept cold air away from water lines. 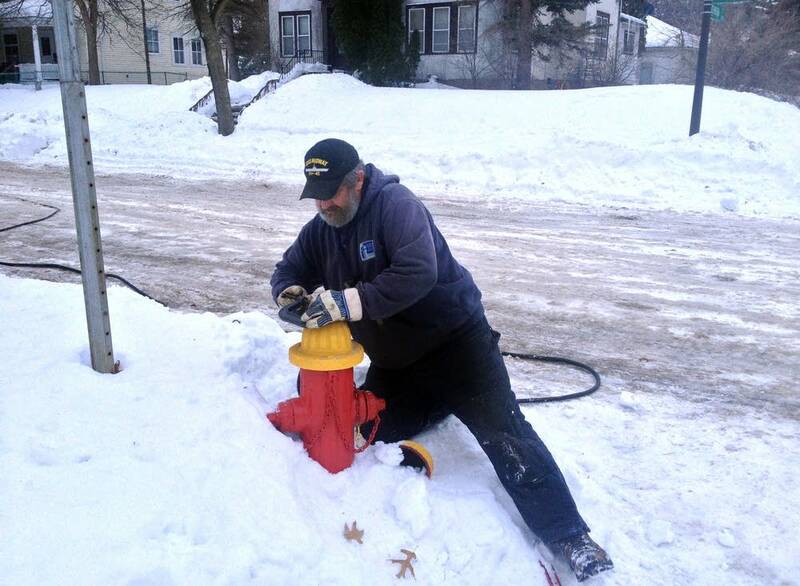 Because of the region's rocky ground, Overby said some water mains are buried above the frost line and insulated. He says those lines had to be flushed out to keep water flowing to customers. "Even in a routine year, we will open them up to allow water movement through those and flushing, basically dumping to ground to make sure that line is fresh," he said. Overby said he expects the biggest headaches to come a few months from now when the ground thaws and shifts and crews will be busy repairing broken water mains as they do every spring.